© Columbia State Historic Park. Four Chinese Miners in Columbia with mining tools - c1866. The first major wave of Chinese immigrants to Gum-Sam (Gold Mountain) was during the gold rush. They began arriving in San Francisco in 1849. In 1850 There were only 500 Chinese men out of the 57,787 immigrants arriving in California. 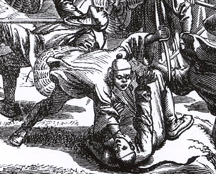 The conditions in China by 1851 during the Taiping Rebellion (1851-1864) made life unbearable. Millions were killed in bloody warfare. By 1852, 11,794 Chinese were living in California and only 7 were women. Some estimates show that at one time there were 1000 to 2000 Chinese in the Columbia area alone. Map showing approximate locations of early Chinese dwellings - 1851. There was also a Chinese theatre at this time with a canvas roof and dirt floors with 40 male actors doing male and female roles. 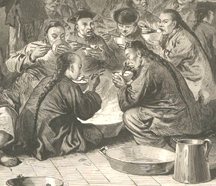 Chinese eating a meal aboard ship. Chinese food was a novelty as well as a delight to the rather bland American food at the time. "The Chinese menu included dried oysters, abalone, cuttlefish, bamboo sprouts, mushrooms, five kinds of vegetables, pork, poultry, vermicelli, rice, salted cabbage, dried seaweed, sweet rice crackers, sugar, four kinds of dried fruit, Chinese bacon, peanut oil, and tea. Seemingly, this was the forerunner of the modem American well-balanced diet. The fare of the Caucasian laborer consisted of beef, beans, bread, butter, and potatoes." (Robert F. G. Spier, "Food Habits of Nineteenth Century California Chinese," California Historical Society Quarterly, XXXVII) One more interesting feature less known is the terrace gardens located in the southeastern section behind maintenance that the Chinese grew many herbs, spices, vegetables, etc. Location of Chinese terrace gardens southeast of town. Chinese Burying Ground Section I, of the Historic Columbia Cemetery, created during the gold rush era, has 473 found grave plots which includes 55 unmarked plots. The first burials at this site are known today (1991) to have been Chinese people who were buried there during the 1852-55 era. When the first Caucasians were buried in 1855 many Chinese graves were uncovered. Their remains were set aside and placed at the bottom of the new grave being excavated. As recent as 1933 Chinese graves were still being uncovered, within the southwesterly area of Section I. There are no known records of their final resting place. (Hart Ralph Tambs August 31, 1991) It is known that many Chinese were sent back to their homeland to be entered there in family plots. 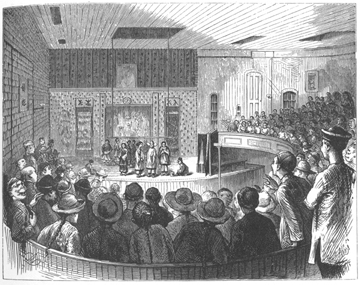 1852 May 8 - A meeting is held by a few Columbia miners to "protect" the town from the evils of too many Chinese. But nothing was really done to rid the town of Chinese. They offered too many other services that single miners required; better food, washing clothes, etc. 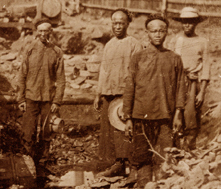 The Chinese miner bidded his time to when the caucasion miners were "done" with their claims. 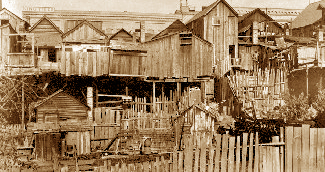 1852 October 2 - The China Wash House on Washington Street. East of property mortgaged by J. P. McClenahan. (E1:3:23) On South side of Washington Street, east of property opposite Boston Bakery on North Side. Caleb Dorsey & Co. purchased the mortgage from McClenahan for $150.00 the property bounded on the east by China Wash House and on the west by the Ticonic Hotel. 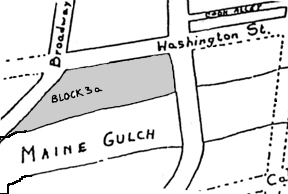 (Block 3A, Lot 44). Block 3a where Chinese had businesses - 1852. 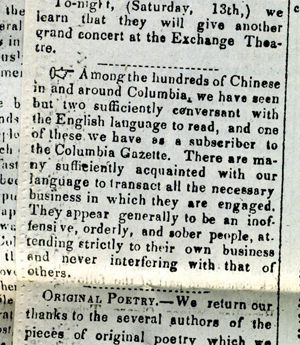 1852	Nov. 13 - The Columbia Gazette runs this article claiming that the Chinese are not a problem in the community. 1852 December 31 - Chinese Chop-Shop (Restaurant), Solomon Samson & Co. - Mortgage to W. Bancock. (Block 3A, Lot 44). 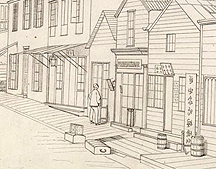 Typical Chinese store fronts - 1854. The Gold Hill that was once the first cemetery located just to the west of the first Chinatown became rich and the burial plots as well as the Chinese were displaced to a new location (Present day cemetery, to the rear of school house). At this time there were many buildings on the east side of Main Street just below Pacific Street that constituted the next Chinatown. The streets were looked much like a typical Canton village. Buildings close together. Single entrance with little space between. Scrolls and red cupolas trimmed in gold gave the Chinese the feeling of their home towns in China. Across the street were Mexican Fandango Houses and south of Chinatown, towards Jackson Street, stood many French establishments. The French continued to get along well with the Chinese. 1854 July 10 - The day of the first big conflagration in Columbia. Sam Hang (The card says "Doubtless a Chinaman.") who was then on Washington Street, listed as having a loss of $600 in great fire. "He probably had a shop or laundry." 1854 July 10 - Chinese boarding house burns at State Street and is replaced with another frame structure. 1854 July 10 - George Chinaman lived on State Street and had a loss of $1000 in the fire. Also "Two China House" Loss $500. 1854 July 10 - John Chinaman on Washington Street loss $500 and Miss "dodo" (means ditto to above, i.e., "Chinaman") loss $200 (prostitute) and another John $200 in the fire. 1854 John Hang sells to Vincent Magendie two houses occupied by Chinese. Assessed to Ah Chee Company. 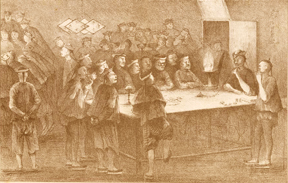 1854 July 31 - The new Chinese boarding house sells to Morris Michael. Chinese war - Charles Nahl. The town fire started next door, reportedly in a Chinese dwelling, on a lot owned by a Frenchman known as Aime Bonnifoi. According to local histories, a Chinaman "cooking his supper ran out into the street to see what a commotion was and returned to find his cloth walls on fire" (Welts 1973:2). 1857 September - the third Chinatown is removed to the location of the present day Columbia Airport. 1857 September 12 - Kowgun returned the property to Lippmann taking a $200.00 loss. 1857 Many of the prostitutes chose to set up "house" in many of the French boarding houses or shanties, instead of being forced out of town. (Union Democrat April 23, 1864) At first there were a few citizens (blacks and whites) who didn't want them there, but the French defended them. 1857 October - The Chinese "started to move down into the center of town. Upper Main Street and Jackson Street were owned principally by Frenchmen, who were more than willing to rent to the Chinese. They soon became well established and from that time on all of upper Main Street between Jackson and Pacific Streets was Chinatown." (CSHP Archives record, page 2) Many stories were told that the Chinese were run out of Columbia for "years" after the fire "they" started, yet the record has them back in force in less than three months. 1858 January 17 - "The worst class of Chinese women (prostitutes) are coming into Columbia again; it was hoped after the fire, that they would be kept outside of the corporate limits. But there are white men who are willing to do almost anything in worship of the almighty dollar, even to encourage the presence of these women." (The Alta; newspaper). 1858 February 14 - Three Chinawomen (prostitutes) and one man shot and buried in "China Plot" of the cemetery. 1858 The Chinese continued to return one man at a time. The following are listed on the map as indicated. Map showing some of the Chinese claims - 1858. 1860 May 15 - A Chinaman buried in "China Plot" of the cemetery. Listed as a "Miner." Chinese businesses in Columbia from the July 1860 Census. See Professional Women for the Chinese Slaves From the July 1860 Census listed as a prostitute. 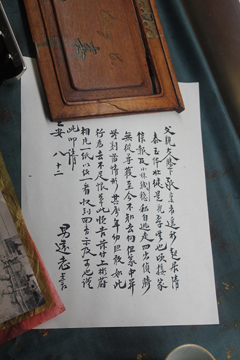 Copy of letter in Museum - FDPØ. Our Museum, in Columbia, displays (currently-2013) a very wonderful and highly respectful letter from a young man to his father. I read that you are still healthy and can take care of yourself. This is what your son wishes for. I just received a letter from home, reporting that little sister (Chin Wai) secretly ran away. Searching for her everywhere but she could not be found. Throughout our family history, we had never treated anyone unfairly or unkindly. She is so young. How could she be so bold as to have such a bad behavior? I just want to briefly tell you that I will not feel anger and just let her go. I enclosed a photo of (Chahm Wie) for you to see. Please let me know and reply to me after you receive it. 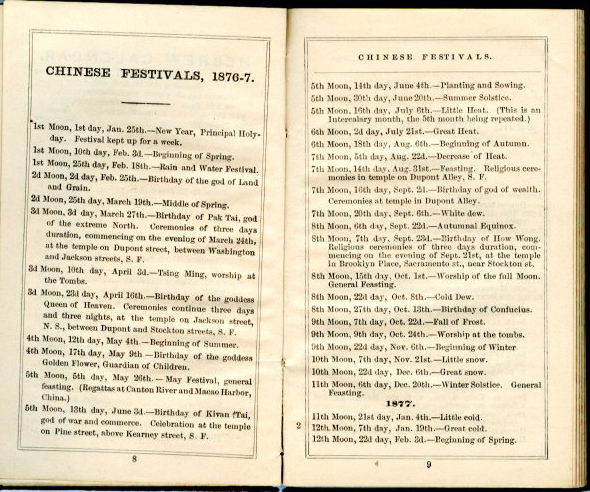 In the 1860s Mark Twain devoted Chapter 13 of Roughing It on the subject of the Chinese. The following is only a small part of his observations. "They are a harmless race when white men either leave them alone or treat them no worse than dogs; in fact, they are almost entirely harmless anyhow, for they seldom think of resenting the vilest insults or the cruelest injuries. They are quiet, peaceable, tractable, free from drunkenness, and they are as industrious as the day is long. "They are a kindly-disposed, well-meaning race, and are respected and well treated by the upper classes, all over the Pacific coast. No Californian gentleman or lady ever abuses or oppresses a Chinaman, under any circumstances, an explanation that seems to be much needed in the East. Only the scum of the population do it – they and their children; they, and, naturally and consistently, the policeman and politicians, likewise, for these are the dust-licking pimps and slaves of the scum, there as well as elsewhere in America." 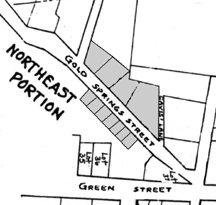 1860 August 15 - Pearl P. Gregory to G. W. Broughton - deed - being two lots on opposite sides of the Gold Spring Road - the lot on the south side "being now occupied by Chinamen." 1860 October 4 - Broughton to N.W. Hawes - deed. 1860 Kowgun assessed for seven frame buildings on south side of Gold Springs Street and three on the north side of Gold Springs Street. 1861 January 18 - A China woman buried in "China Plot" of the cemetery. Listed as a "Prostitute." 1861 February 25 - A Chinaman buried in "China Plot" of the cemetery. Listed as a "Miner." 1861 November 11 - A Chinaman buried in "China Plot" of the cemetery. 1862 March 3 - A Chinaman buried in "China Plot" of the cemetery. 1864 August 1 - Chinaman Ah Sin dies of an unknown cause and is buried in "China Plot" of the cemetery. 1864 October - At 4 o'clock in the morning fire destroys two Chinese buildings. Both fire companies managed to stop the fire with only two buildings lost. $500 loss. Arson was ruled the cause. 1864 October 29 - China man dies and is buried in "China Plot" of the cemetery. 1865 February 1 - China man dies of an unknown cause and is buried in "China Plot" of the cemetery. 1865 There are nine frame buildings belonging to Chinese on south side of Gold Springs Road and one small frame and a brick bldg. on the north. 1865 June 5 - Columbia has a fire. Accidentally started in a stove pipe at a bakery on Jackson Street, this fire nearly wiped out Chinatown and the two story building on the corner of Jackson and Main Streets, the Long Tom Saloon. Chinese rebuilt, as did the owners of the saloon. 1865 Wages in the mines was a low $2.50 for American miners and half that for the Chinese. "As a class they are quiet, peaceable, patient, industrious and economical. Ready and apt to learn all the different kinds of work required in railroad building, they soon become as efficient as white laborers. More prudent and economical, they are contented with less wages. We find them organized into societies for mutual aid and assistance. These societies can count their numbers by thousands, are conducted by shrewd, intelligent business men who promptly advise their subordinates where employment can be found on most favorable terms. No system similar to slavery, serfdom or peonage prevails among these laborers. Their wages, which are always paid in coin each month, are divided among them by their agents who attend to their business according to the labor done by each person. These agents are generally American or Chinese merchants who furnish them their supplies of food, the value of which they deduct from their monthly pay." 1865 October 24 - China man dies of an unknown cause and is buried in "China Plot" of the cemetery. 1865 December 8 - Chinaman mentioned above is buried in "China Plot" of the cemetery. Crime committed is unknown. 1866 January 30 - China man shot and is buried in "China Plot" of the cemetery. 1866 December 18 - China man, Fook Zow is buried in "China Plot" of the cemetery. 1866 December 23 - China man, Ching Sow is buried in "China Plot" of the cemetery. Disputes over "benevolent" societal rules? NOTE: By 1868 - Twelve thousand Chinese were working in construction on the railroad. Union Pacific joined the Central Pacific at Promontory Point, Utah, on May 10. NOTE: By 1870, 3,536 Chinese women had emigrated to California, 61 percent (2,157) listed as prostitutes. 1872 Sun Yo Wo sold building to San Ling Sing. 1875 October - Vincent Magendie property of two houses, Ah Chee sells to Fred Zwickert Ah Chee & Co.
1876 Oct 16 - Ah Chee & Co. The old Hoerchner lot was assessed to Ah Chee & Co. Inside a typical Chinese Theatre. 1882 May 6 - A federal law passed in response to complaints by workers on the West Coast that competition from Chinese immigrants was driving down their wages. It suspended Chinese immigration for ten years and declared Chinese immigrants ineligible for naturalization as American citizens. The law was renewed in 1892 for another ten years, and in 1902 Chinese immigration was permanently banned. Chinese immigrants did not become eligible for citizenship until 1943. 1882 September 16 - "At 5-1/2 o'clock on the morning of Sunday September 10th a fire broke out in the Chinese Theater building, a large wooden structure on the southwest corner of Main and Pacific Streets, and before the rapid spread of the flames were checked eight buildings, including the theater were totally consumed, Chinese gambling houses and stores. "The loss falls heaviest on Eloy, merchant, whose loss is estimated at $300. His store with the entire contents, was burned. See the rest of the story! 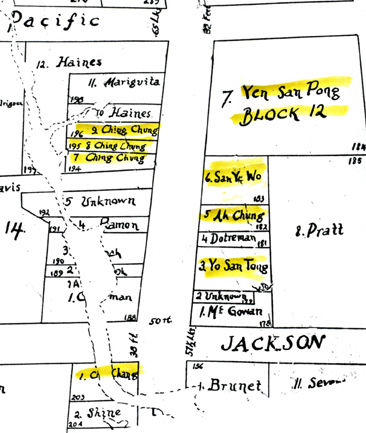 1880s-90 Chin Wow (Chinese prostitute) owned a house on Main Street (north side of Jackson Street). (she died in 1901). 1880s-90 Hog Mary (Chinese prostitute). Was called that due to her size and body shape. She also was known for her sharp loud voice. She moved to Knights Ferry in 1890's. c1930s Chinese are sent home. The practice of secondary burial and removal meant that many former cemeteries are considered as having no Chinese buried there. This is not a valid conclusion because not all bodies were removed and returned to China; in particular, women (many of whom were prostitutes) seldom participated in the arrangements which funded the systematic removal. Others were not exhumed because they failed to pay for the service. 1954 A sign existed in Columbia with Chinese characters that stated, "The Sun was Shining on the Good People." With "donors" names listed as Mah In Teng, Mah In Ying, Mah Yen Bon, Chu Nook Wa. The sign is c1860-70. Usually signs like this were for a merchant to add to his prosperity. They had nothing to do with the name of the store. 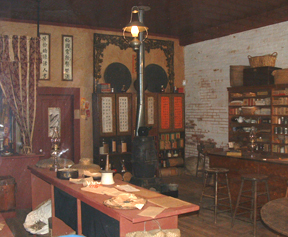 c1958 Chinese herb shop exhibit was installed in Bayhaut Building. 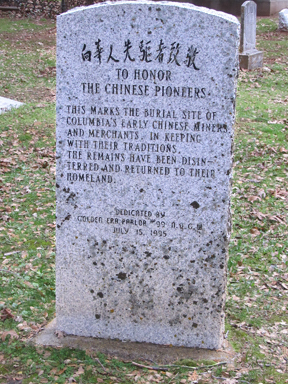 This marks the burial site of Columbia's early Chinese miners and merchants. In keeping with their traditions, the remains have been disinterred and returned to their homeland. Today we see some of the results of the Chinese presence in the gold fields with the stink weed called Tree of Heaven. Also known as ailanthus, Chinese sumac, and stinking sumac. It was brought here because it was one of the oldest medicinal recipes, recorded in a work from 732 AD, it was used for treating mental illness. © Floyd D. P. Øydegaard. Most information comes from personal journals, census, World Book Encyclopdia, Columbia Archives, and where noted.